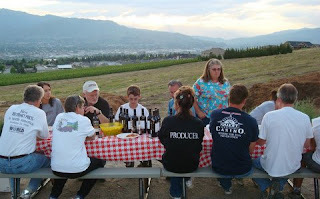 I spent the weekend after commencement in Wenatchee, Washington helping Mike and Karen Wade and their friends bottle the 2005 vintage of Fielding Hills. I got to drink some great wine, meet some wonderful people and learn more about the wine business. Here are some photos (courtesy of Dave Seago) and some observations. The Wades are orchardists and fruit distributors in Wenatchee, which is the heart of Washington Apple country. They got the wine bug a few years ago and now run an 800 case operation from a building near their home, overlooking the Columbia River. The grapes come from vines they own near Matawa on the Wahluke Slope, further down the Columbia. 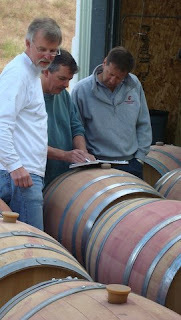 They make reds — Cabernet Sauvignon, Merlot, Syrah, Cabernet Franc and a blend called RiverBend red. These wines are not easy to find (remember: only 800 cases total) but they have received rave notices in the wine press: Wine Enthusiast rated them all between 91/100 and 95/100 points in its December 2006 assessment of the 2004 vintage. They are all good, the magazines and web sites say, the only question is which one is best. I know the Wades through their daughter Robin who is one of my students at the University of Puget Sound. She knows about my interest in the wine business, so when they needed volunteer labor for the annual bottling weekend, she knew who to call. I have taken dozens of tours of large wine-making operations, so it was interesting to see the process first-hand and on a very human scale. I hope the photos capture something of the process. We bottled the Cab, a blend featuring 76% Cabernet Sauvignon, on Friday afternoon. The first step was get the appropriate barrels of wine out of storage and to carefully pump the right proportions of the right wines into a large stainless blending tank. From there, the wine moved to the assembly line, where I worked alongside about a dozen of the Wades’ friends and neighbors. The bottling process reminded me of Adam Smith’s famous pin factory example of the division of labor. One person (1) brought in pallets that contained cases of empty wine bottles. A second person (2) removed the bottles from the cases onto a table so that another worker (3) could invert them over a nitrogen supply, which removed any oxygen. 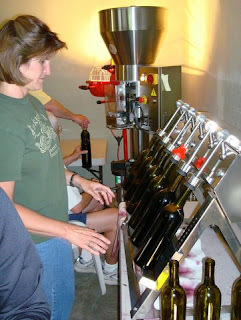 The bottles were then (4) filled with wine on a six-bottle machine (see photo), then corked (5). A foil closure was then placed over the cork top (6) and secured firmly using a surprisingly nasty electric device (that was my job — #7). Then the bottles were wiped down (workers 8 and 9) before going through a label operation (10), being loaded back into boxes (11) that were sealed and stacked (12) and then moved out on the pallets they came in on. 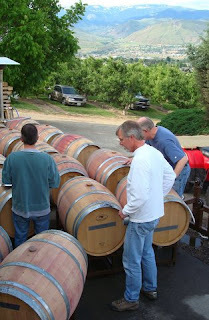 It took us about six hours to bottle 200 cases of Cabernet Sauvignon on Friday afternoon. We did 150 cases of the RiverBend Blend in four hours on Saturday morning. My reward? Wonderful family-style meals with my co-workers and one bottle of each of the wines I worked on, autographed by my fellow volunteers. One thing I learned from this is that although 800 cases of wine is a tiny operation by the scale of today’s wine business today, it is still a very significant investment of time and energy. 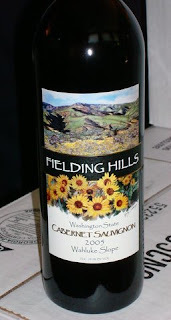 I thought we would never come to the end up those 200 cases (2400 individual bottles) of Cabernet on Friday afternoon! Because they have been so successful, both in terms of wine quality and wine economics, the Wades are planning to take the next step — to expand production from 800 cases to 2400 cases. This is a big step, since the business model changes with the higher volumes. Family labor plus volun teer help at key points works fine for wineries producing 1000 cases or less, but a bigger operation means hired help and higher fixed costs. The marketing end changes, too. The Wades prefer to sell most of their wine direct to customers rather than to discount it in order to get it into wine shops and restaurants. Given their stellar ratings, they have a good opportunity to build a “wine club” list that will automatically take most of their output, matching demand and supply very efficiently. Building a bigger winery will mean matching a bigger demand to their bigger supply. Mike Wade told me what it takes to make good wine — it’s in the fruit, he said. The economics of wine is in the market — matching demand and supply. I would say that the Wades understand both the fruit side of their operation and the market side, too.